Saturday Competition: Win this beautiful Damien Weighill print! Saturday is rapidly turning into Competition Day on Ultra Culture, and this week I’ve got an absolutely beautiful piece of thing to give away. 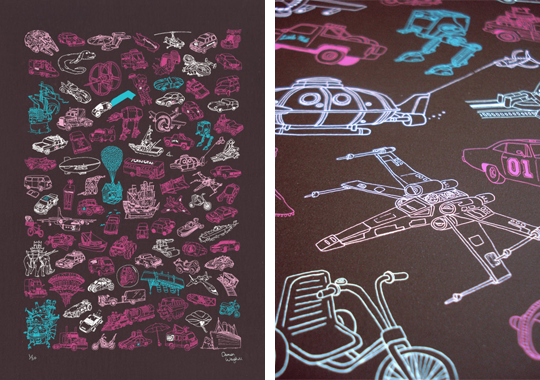 Dangerously talented illustrator Damien Weighill (of ALL THIS AMAZING STUFF fame) is graciously offering up a 50x70cm screen print of his stunning Movie Vehicles piece, featuring nearly one hundred cinematic transportation devices from Balloon Houses to X-Wings. You can buy the print, along with all sorts of other goodies, over at his online shop. To be in with a chance of winning, comment below with your idea for a new, never-seen-before movie vehicle. The best one wins the print.